Since the ancient times the Rajas would dedicate hero stones, called Bira Kall, to the memory of martyrs. 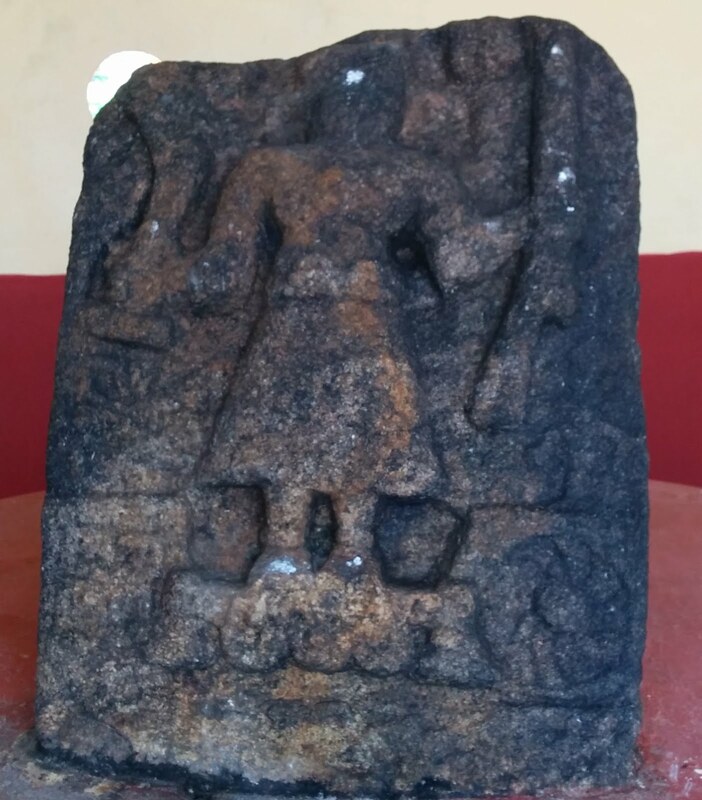 Many hero stones were found in North Kodagu, especially around Somwarpet. These coarsely sculpted granite tablets, often issued by the rulers and otherwise commissioned by affluent families, were also known as Kolle Kallu, stones of the killed. A number of them have been lined up around the Government Museum within the Madikeri Fort. Often the hero stone comprises of two or three panels. Usually at the top of the hero stone is inscribed a circular sun and a crescent moon. At the bottom are the carved figures of men and women holding weapons such as swords, shields and bows. Some sculptures were in the classic style found elsewhere in Karnataka, such as in Mysore and Shimoga, until as north as Belgaum, and in parts of Tamil Nadu to the South. In such hero stones the topmost compartment, underneath the etched sun and moon, would have a Linga and a bull with worshippers around them. The second would show the hero ascending the heavens with apsaras on either side fanning him. The third would have the hero battling other warriors during his life on earth. Sometimes there is a fourth, the bottommost, compartment which might have a horse and an elephant etched. 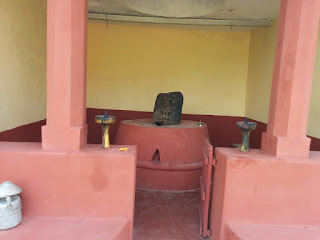 The most well-known of these Bira kall in Kodagu, also one of the more recent ones made in 1768, has an image representing Kannanda Doddayya the Dalavayi, or army general, wearing the traditional Kuppya Chele costume with an early gun in one hand and a native Oide katti war knife in the other. When Hyder Ali unsuccessfully attacked Kodagu, Doddayya stood before Muddu Raja II on the eve of the battle and declared: “Twice before have I returned after defeating Hyder and bowed to you but this time I shall not be back”. Indeed in 1767 Doddayya was fatally wounded near Kajur Bagilu even as his army returned victoriously. Later, his house was destroyed and twenty four members of his family were killed by Hyder's son Tipu Sultan. According to G. Richter, in the 1870 book 'Manual of Coorg', Doddayya's Bira Kall was first placed in a paddy field, upon a hill slope and opposite the Mercara Central School. 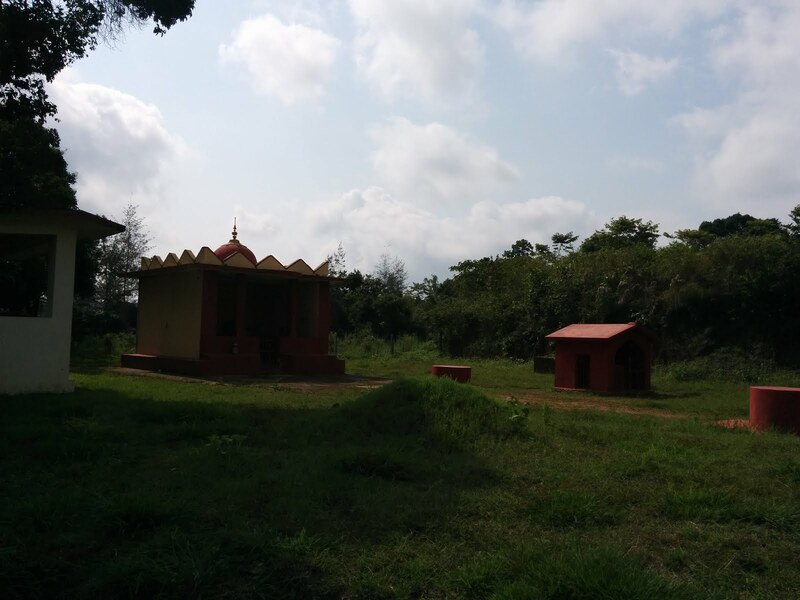 A Kaimada, a small sanctuary built in remembrance of ancestors, was built a few decades ago and the Bira Kall was shifted into it. In front of this place, which is also called the Birappa sanctuary, and to its right is a shrine dedicated to Vishnu Murthy (Vishnu's image). To the left of the Bira sanctuary is a shelter, called the Pavali, where a number of devotees can sit within. Behind the sanctuary and to the left is a Trishul, planted upon a raised platform. 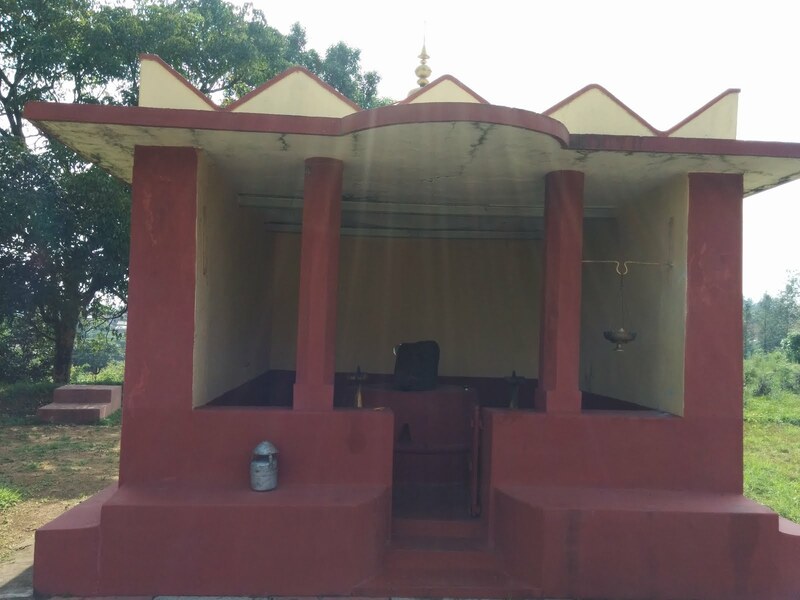 There are two raised stone seats, one behind the other and facing the Birappa sanctuary. The Kannanda family has three more memorial stones, featuring some more family members, placed inside another shrine. While one stone has a male ancestor with younger members, the second has a woman with children around her and the third shows two male ancestors holding weapons. 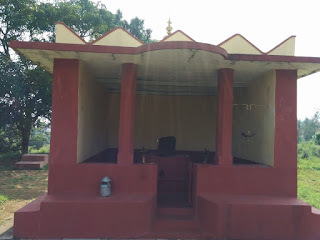 Beside this second shrine is another Pavali with stone benches inside. When I paid a visit to this Bira Kall site Mr. Kannanda Suresh, his wife Mrs. Kannanda Ashwini and a clan elder Mr. Kannanda Pookunhi narrated the legend of Doddayya. Accordingly, Doddayya's Kodagu army had successfully defeated Hyder Ali's army and were returning back victoriously. But unfortunately Doddayya was struck and wounded on the way. The Raja, initially pleased upon seeing the return of the victorious army, was dismayed when he heard of the dying general. Doddayya was led up the walls of Madikeri fort and all the lands that he looked upon were then granted to his family by the grateful Raja. Part of this was what is today called the Kannanda bane (land) in Madikeri, the area beyond Mann's compound and Ajjamada Devaiah circle. Doddayya passed away and a Bira Kall was made for him. Some more land grants were made to the Kannanda family by the Rajas. Thus the family came to own lands in seven places: Bavali, Madikeri, Haleri, Poramale, Kajur, Noorokkal and Katakeri. At one point the Kannanda family owned half of Madikeri. Family members sold away most of their lands over the years. Now only three of the original seven places exist with them. A week after the festival of Shivaratri the Pade Bira (war hero) Kannanda Doddayya is remembered and a two-day festival is organised. Dance and enactment performances, called There, are arranged. On the first day Prasada is prepared and the Guru Karana, an ancestor who was the preceptor as well, is remembered. The Bhandara, money offered at the temple, is moved that evening. Throughout the night the Anji Koot Murthy (five spirit deities) There is held. At dawn the next day the Vishnu Murthy There is held. In the finale the Pade Bira There has a performer imitate Kannanda Doddayya and the Nari Pooda (tiger spirit) There has another performer emulate a tiger. The Pade Bira and the Nari Pooda performers together dance frantically around the place but while the Pade Bira sits upon the seat near the temple, the Nari Pooda sits upon the seat away from the temple. The Nari Pooda performer leaves early while the Pade Bira performer is the last one to remain.